Do your kids love building? Do you want to teach your kids to know and love God’s word? 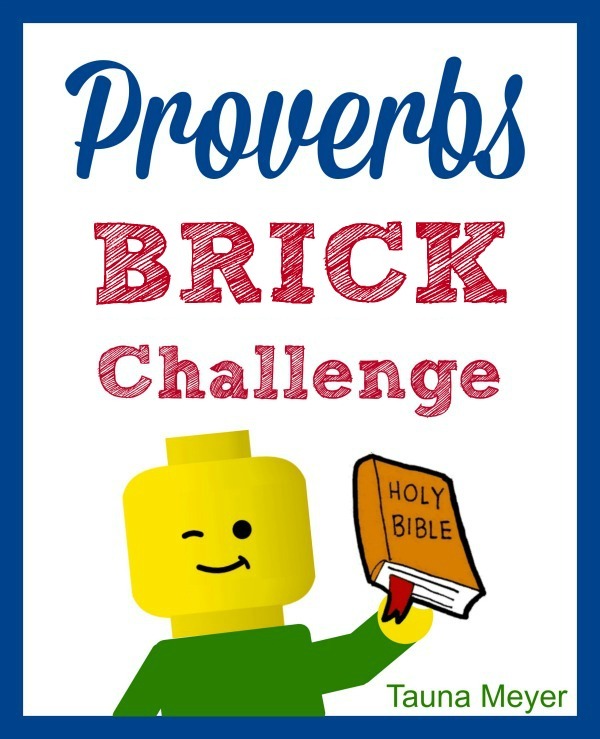 The Proverbs Brick Challenge is a fresh and fun way to learn these verses of wisdom. Your kids will have a blast building creative representations of ideas as well as scenes from the scriptures. At the same time, they will learn biblical truths that will become a part of their ongoing faith journey! The challenge covers many learning styles to help kids really retain the scripture. There are careful listening skills being developed, as well as problem solving, creating, building, drawing, and writing. There will be great opportunities for discussion as well! Proverbs Brick Challenge is available for just $5.99 NOW in the Proverbial Homemaker store! I was hoping to win a BYB and didn’t, so I was going to pass this year. But your LEGO challenge made me change my mind. I HAVE to get this for my boys, and why not get a few other things for a few bucks more!? Thank you!! This looks so awesome, we are studying proverbs in depth this year my boys are 2,4,&6. Is this KJV? I don’t have KJV for the Proverbs one but I do for the Matthew one. I can work on the KJV version of the Proverbs one next. 🙂 The Matthew Lego Challenge is available in the store if you’re interested! How many individual lessons is this broken up into? I’m interested in the Easter and Proverbs lego packs, but I am a visual person and cannot tell by what is there if it will be a fit for my children. May I see a few more pages? Hi Victoria! I tried to email you but it wouldn’t go through. Feel free to email me at tauna (at) proverbialhomemaker (dot) com and I’ll send you some examples! My son is 10 and I’m not sure what ages your curriculum is geared for. Is he too old for the Lego challenge builds? My son just finished kindergarten and I was wondering about the ideal age range as well. I use all of our Brick Challenges for my kids ages pre-k through 3d grade, although older kids would love them too. If my younger kids aren’t yet interested in building, they use the drawing pages. But for K/1st this will work well! I love the sound of this, but I don’t understand the challenges… Does the packet include more information about how to do the challenges? For example, the first one, “Father and mother teaching children.” Do the kids just try to show that with legos? Or is there more to it? No, there is not really much more to it that that. They use their imaginations and their legos to create a scene, or perhaps an object that represents that idea. It’s kind of like drawing. There is guided drawing where I can show a finished drawing or a set of step-by-step instructions for how to draw something. There is also free drawing where I just give them a goal or idea and they draw something to represent that. I found that especially with the Bible challenges the latter was better. The kids think more closely about what they’ve read/heard, how they can show that in legos, and they just remember the stories and ideas better that way. Sometimes they will want some inspiration on how to build a certain object. Like maybe they want to build something showing the holiness of God and want to build throne. Going onto youtube or goggle to look up how to build a throne with legos (or just looking at the images in the results) can give them great inspiration without making it a step-by-step instruction type of activity. I hope that makes sense! 🙂 Feel free to email me or comment if you have any other questions.